Even if you have a garbage disposal, you may find that your kitchen sink smells a bit from time to time. Empty half a box of baking soda down the drain while you run warm water and the baking soda will take away many of the smells that are coming from your drain and pipes. Are Your Carpets in Need of Freshening? As with furniture, baking soda can bring a fresh, clean scent back to your carpets without the need for chemical cleaners. Sprinkle baking soda all over your carpet and let it sit for 30 minutes. Vacuum and enjoy the fresher, cleaner scent of your rugs. Is Your Backyard Grill Getting Too Dirty? Unless you are meticulous in cleaning your grill after each use, it will start to get dirty over the course of the summer. Baking soda can help clean up your grill in a jiffy! Simply sprinkle dry baking soda on a damp sponge (or use a baking soda and water paste with a wire brush for really tough grime) and wipe your grill clean. Is Your Dog a Bit Smelly? Is your dog smelling a bit too much–well– like a dog? If so, baking soda can be used to freshen your dog in a safe and inexpensive way. Simply sprinkle baking soda on your dog and massage the baking soda into your dogs hair. After rubbing it in, give your dog a thorough brushing. Your dog will love the bonding experience! Are you Embarrassed by Smelly Sneakers? Sneakers and other footwear do not need to stink. 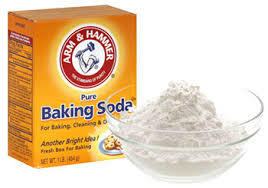 Pour a little baking soda into your sneakers before you wear them and the baking soda will absorb odor-causing sweat while it neutralizes the smells that are already in your sneakers. You can also use this tip for your shoes and boots!